PourSteady, The BeagleBone Barista #BeagleBoneBlack @TXInstruments @BeagleBoardOrg « Adafruit Industries – Makers, hackers, artists, designers and engineers! 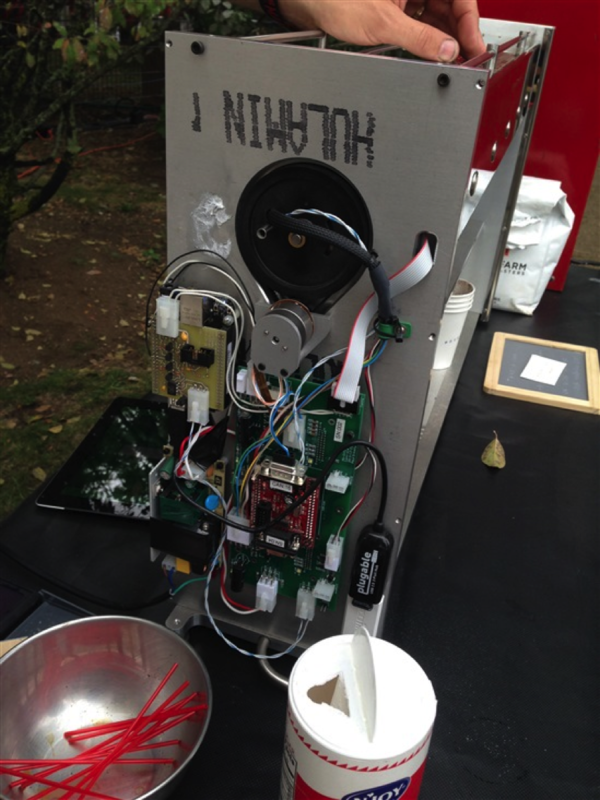 Coffee and robotics lovers will love PourSteady, which is a robot barista running on the BeagleBone Black. Baristas may soon have another handy coffee creator by their side in the form of the PourSteady – a robot that makes five cups of pour-over coffee in parallel by carefully pouring a measured amount of precisely heated water in spiral patterns, just like a professional barista would do. This innovative project utilizes industrial automation motor controllers on a CANbus, I2C I/O expander chips for buttons and lights, high-side protected FETs to actuate valves, flow meters, USB Wi-Fi, USB Bluetooth, temperature controllers, and power supplies to create a perfectly roasted masterpiece.